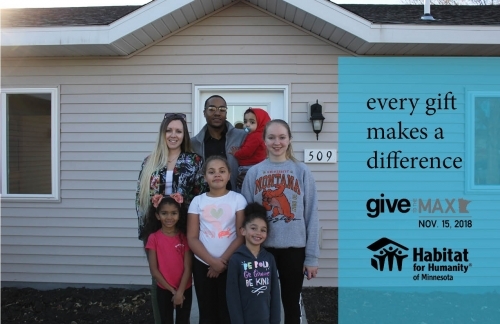 Visit Habitat Minnesota’s Give to the Max Day page here! Ten years ago, when GiveMN.org was a brand new and relatively unknown website, a group of people decided to try to raise awareness about giving online by creating a one-time, one-day event focused on online donations. By the end of the day, everyone’s expectations had been shattered by an outpouring of $14 million from generous Minnesotans, and a new giving tradition—Minnesota’s giving holiday—had been born. Give to the Max Day celebrates its 10th anniversary on Thursday, November 15, 2018! Join GiveMN and thousands of your favorite nonprofits and schools as we raise millions of dollars for the organizations which make our communities stronger. Affordable housing is at a critical juncture in Minnesota today. More than 554,000 households struggle to afford decent housing in Minnesota today. One out of every four families in Minnesota is paying more than they can afford for housing. Habitat for Humanity meets the needs of lower-income Minnesotans as well as single heads of households, households with disabled family members, seniors, large families and those that don’t qualify for traditional mortgages. 90% of homeowners feel better about their children’s futures after moving into their Habitat home (Wilder Research, 2015). Yet for every Habitat home built or repaired, there are thousands more that could benefit from Habitat’s assistance. Driven by their goal of increased independence and a space of their own, Katie and Robert were encouraged by friends and family to apply for a Habitat home. Together, the two have five children and live in a three-bedroom apartment where the radiators are always hot, presenting a safety concern for the children. To alleviate the heat in the apartment, they open windows, which end up freezing open in the cold Minnesota winters. They long for a yard where their children can safely play. The oldest children started school in a nearby community and, since they want to keep their children enrolled there, Katie drives 20 minutes each morning to drop them off. The oldest daughters often stay with grandparents in order to have their own space and be closer to their school and activities. In March of 2018, Katie, Robert and their children learned that their dream would soon become a reality: a yard for the kids to play, a place to do laundry, an attached garage, and a place for the whole family to be together. “This is the beginning of something absolutely amazing,” said Katie and Robert. Looking to support a local Habitat organization? Check out Give to the Max Day fundraisers around the state!